Do you have a G3 license? (G3 license holders are in positions where they have their own dedicated PCs and do not work in shared-computer environments.) If so, you have the rights to install Office on up to five computers. Like other Microsoft software, Visio likes to help sometimes and it may differ from your undersanding of the word. One common way of helping is to create new pages automatically for you if you get too close to the margins. As map makers, you want your drawings to be close to the margins but without making new pages. Find the Auto Size button on the left side of the ribbon. Click the button. It is a toggle, so it will turn back on if you prefer it to be enabled. Click the Page Layout tab at the top of the screen. Click on Margins (in the Page Setup section). At the bottom of the menu that appears, choose Custom Margins. In that same window, click Center on Page Horizontally. 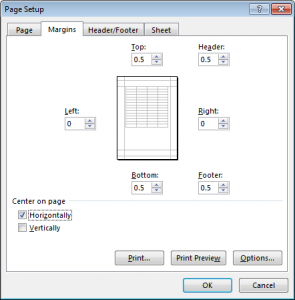 While still in Page Layout tab, set Width to 1 page and set Height to 1 page (in the Scale to Fit section). 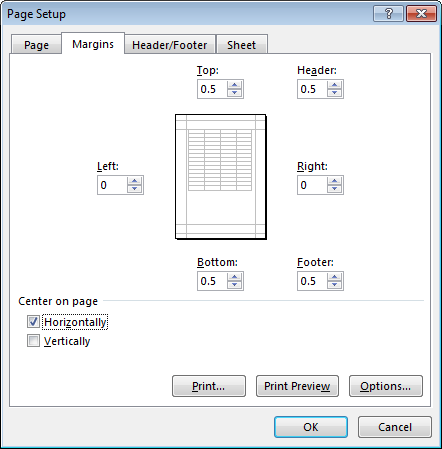 Select Page Break Preview (toward the left side of the ribbon). If a dialog box appears, click Do Not Show Again and then OK.
You will see a blue margin line on the far right side of the document. Drag that blue line to the left, all the way to the edge of the document where the blue shaded text box ends. Note: To return to the previous view so that you do not see Page 1 written across the spreadsheet, select Normal, which is located next to Page Break Preview on the Page Layout tab. Click the Page Layout tab and click Margins. Select Last Custom Setting (the first item in the list). 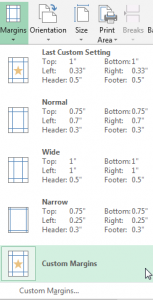 Set Width to 1 page and Height each to 1 page while still in Page Layout, as you did earlier (above). Click the View tab and select Page Break Preview . You will see a blue margin line on the far right side of the document. Drag that blue line to the left, all the way to the edge of the document where the blue shaded text box ends. 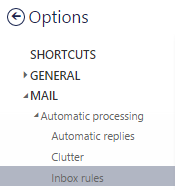 Log into Outlook and click the gear icon on the right side of the title bar. Click the triangle next to Mail to expand the menu item if it is not already expanded. Do the same for Automatic Processing and select Inbox Rules. Find the Outlook rules tool icons and click the plus symbol icon (+) to create a new rule. Go through the setup steps as desired. Since there are a considerable number of combinations as to what you might want to do with rules, this TechTip will not offer specifics beyond this point. If you need more assistance after you have experimented with creating your own rule(s), please contact Jeff Feiertag, IT Training Coordinator.